Over the coarse of Frank Lloyd Wright’s career he built 532 structures and designed over 1000… talk about an overachiever! I have talked about my love for Wright designed structures often on this blog as I find him fascinating, both personally and professionally. He was a brilliant architect, who was well ahead of his years, but also led a life that could even to this day make the front page of the tabloids. Later in Wright’s career he began experimenting with his designs. In the 1920’s he started using textile concrete blocks after being inspired by the Mayans. I will be honest, this is my least favorite period of his career but as a fan of him I will still tour the ones I do not like as much. We arrived at Hollyhock House early and explored the exterior prior to our tour starting. No interior photos would be allowed, so I took as many exterior photos as I could before the tour started. The house gets it’s name from the hollyhock designs found in the art glass windows and the cement castings found around the house. 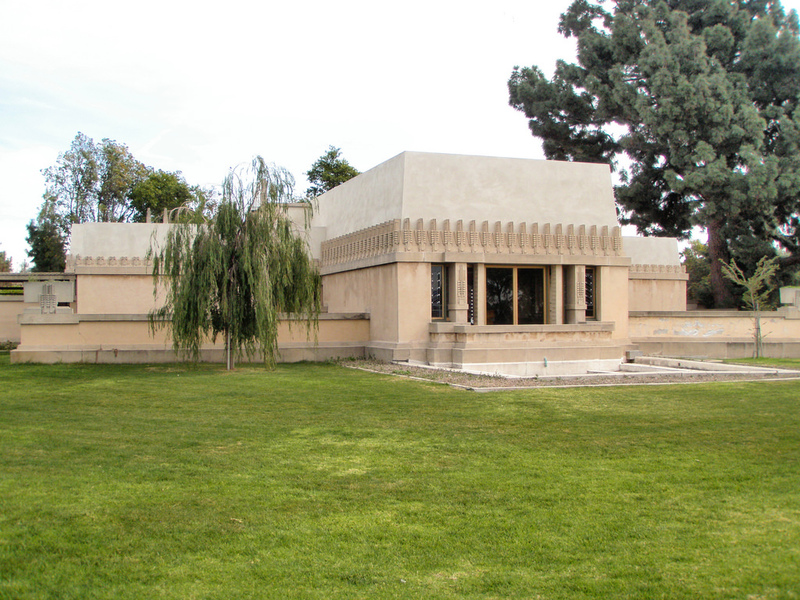 The Hollyhock House began construction in 1919 and finished in 1921 for Aline Barnsdall. Wright, although worked on the plans for the house, did not supervise the construction, leaving the responsibility with his son Lloyd Wright and his assistant Rudolph Schindler. This was more common behavior later in Wright’s career, but one must delegate when demand is too high, right? At the time of Hollyhock’s construction Wright was busy working on the Imperial Hotel in Japan. In typical Wright fashion, the budget for construction costs was blown and Barnsdall ending up donating the house to the City of Los Angeles as she was not prepared for the initial costs or the upkeep costs. The building has been open on and off to the public for the past 88 years. The house was most recently closed in 2008 for renovations and reopened February of 2015 after $4 million dollars in repairs. Not really a surprising price tag as Wright houses are known more for their beauty than their ability to withstand the years. 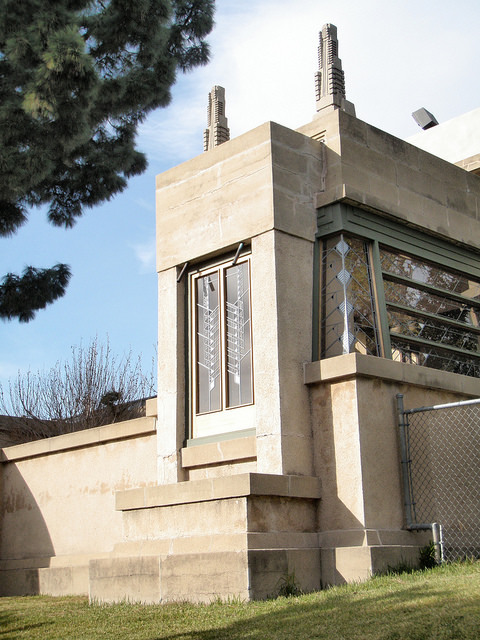 The Hollyhock house stays true to Wright fashion with a hidden entrance and a long corridor to the front door. The house also uses glass corners for windows, a concept later used at Fallingwater. Wright’s theory was to allow your eyes to take in all the nature from the outside without the unsightliness of window framing. Although this is my least favorite style of Wright’s, it is still a Wright home and beauty can be found there. Inside the heavy wood beaming that I adore is found as well as his signature large fireplace. 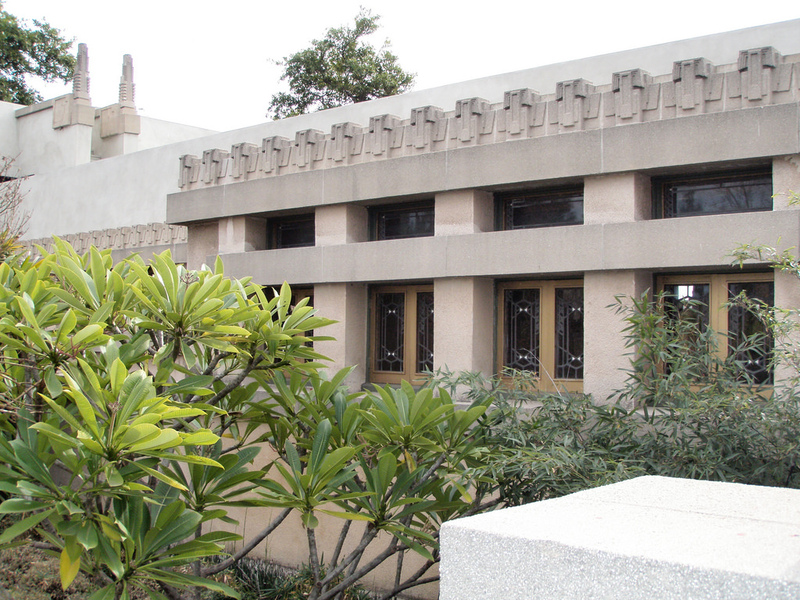 Frank Lloyd Wright’s Hollyhock House can be found at 4800 Hollywood Blvd Los Angeles CA 90027. Hours are Thursday – Sunday 11am – 4pm. Tours are self-guided and $7 for adults, $3 for seniors, students and children 12 and older. 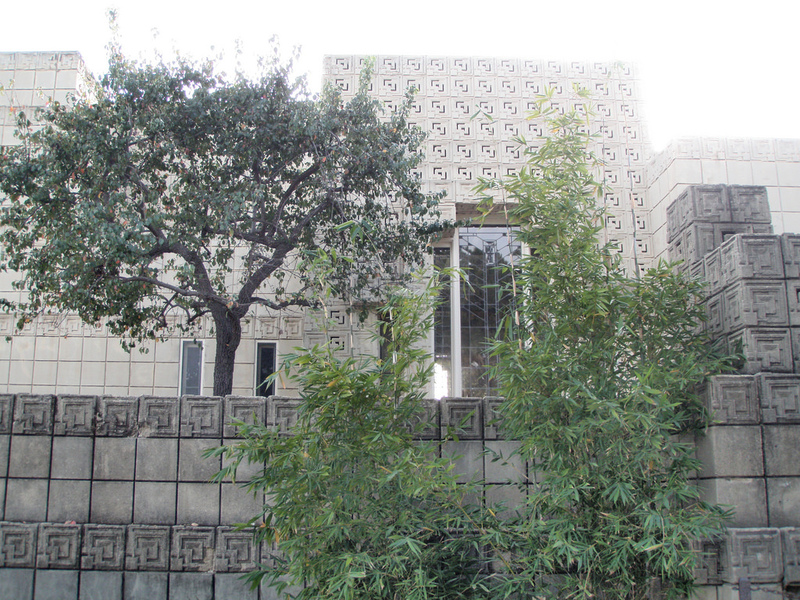 While in the area we drove over to the Ennis House, another Frank Lloyd Wright designed house. This is a private residence, so we were not allowed to tour, but we could see the house from the outside. 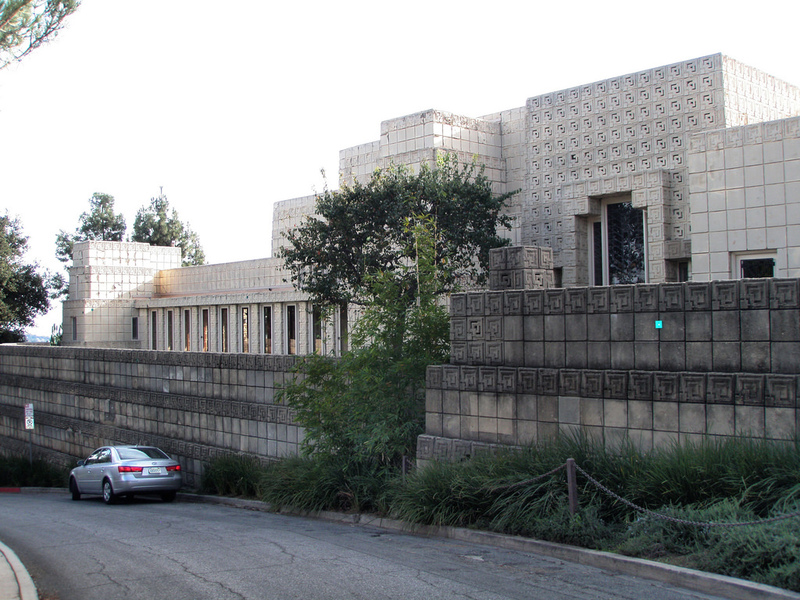 The Ennis house may be familiar as it has been featured in such films as Blade Runner, The Karate Kid III, and the television show Buffy The Vampire Slayer. Like you, I am a FLW fan, and the LA properties are not my favorites – though still beautiful. Being a kid in LA, I thought Hollyhock was a mausoleum and couldn’t figure out why my dad wanted to go see it! Later in life, I actually did go see it and did develop a love of Wright’s design and architecture. I didn’t know the home was renovated – Time to schedule a return visit! It does sound like it is time for another visit!